MEP Linnéa Engström (Greens/EFA) is vice-chair of the European Parliament’s fisheries committee and head of the delegation to the International Commission for the Conservation of Atlantic Tunas. MEPs Ricardo Serrão Santos (S&D) and Norica Nicolai (ALDE) are members of the fisheries committee. Every year, the world’s fishing nations gather together to discuss quotas (TAC) and other management measures for the valuable tuna species. This meeting is called ICCAT: the International Convention for Conservation of Atlantic Tuna. It also deals with fisheries for swordfish, various smaller tuna species and, in part, sharks, rays and turtles. The bluefin tuna is a remarkable fish. It can be as big as a pony and swim huge distances. A large and beautiful animal from pre-historic times that brings enormous value ​​to those who capture it. Because of its popularity, the bluefin tuna has been heavily overfished and the Atlantic populations were under such pressure that they almost collapsed at the beginning of the century. A collapsed stock is difficult to recover and some never do, one example being the cod stocks on the Grand Banks of Canada. Maria Damanaki, a former EU Commissioner, played a key role is turning the situation around in 2009. Mrs Damanaki not only had the courage to push through a completely new common fisheries policy during her time as Commissioner. She also found allies in ICCAT for severe fishing restrictions and quota cuts, which allowed the stocks to recover. Now, years have passed since the draconian measures and some scientific advice indicate that the bluefin tuna has recovered in a remarkable way. If this were true, it would of course be immensely pleasing. However, the uncertainty is great. It is a huge challenge to make reliable stock assessments of migratory species with only poor data on catches and other parameters, due in part to high levels of illegal fishing. The Commission however supported increases in the quota to 36,000 metric tonnes in 2020, an increase of 50% from the current level. This would be the largest TAC ever proposed. It is extremely doubtful whether this is sustainable. The data that underpin the stock assessments are not reliable enough to be certain that such an increase will not jeopardise the stock. In addition, a portion of illegal fishing makes the situation even more complicated. Scientists estimate that a radically lower TAC, closer to 28,000 tonnes, would allow the stock to continue its recovery. The same week as Commissioner Vella attends the COP 23 in Bonn, where he tries to claim that the EU will fight for the oceans and put sustainability first, the Commission is pushing for the largest TAC of bluefin tuna ever seen, without a solid scientific basis. This is nothing short of disgraceful behaviour by the EU executive. 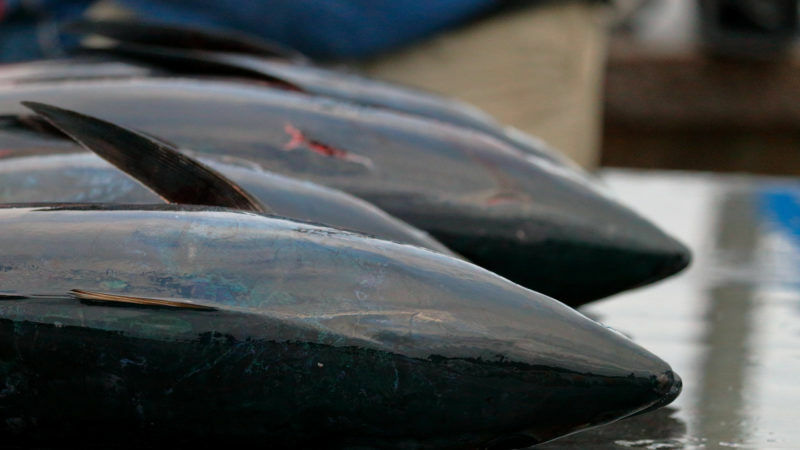 Other discussions revolve around tropical tuna species like Bigeye, Yellowfin tuna and Skipjack. They are heavily exploited and that’s a European problem since there are the Spanish and French fleets fishing with so-called ”FADs”: fishing aggregating devices, which contribute heavily to the problem. FADs, which are designed to attract tuna to make them easier to detect and catch, may be simply a round floating device in the water, while the more advanced are technically highly developed. Regardless, they capture large amounts of fish, including small juveniles. The fish never reaches maturity to reproduce since the FADs capture so many juveniles, causing the stocks to decline rapidly. At the meeting, South Africa together with several developing economies and Japan put forward a radical proposal to freeze the number of FADs at the levels used in 2015 for one year until scientific advice on the impact of FADs has improved, with a view to possibly reducing their use. The EU refused to take part in this discussion, politicising the whole discussion. Sharks are under great threat because of overfishing. What was discussed at this ICCAT meeting is shortfin mako shark, which is at risk of collapse. Sharks are often caught as by-catch in other fisheries, as well as being sought for its fins – a very destructive practice where the fins on the shark are cut and the rest of the fish is dumped into the sea. The hope is that conservation measures could be introduced and that the quota for shark is reduced radically. Finally, there are structural problems that must be addressed with international tuna meetings. EU member states without financial interest in fisheries often do not participate in meetings. But it is important to remember that the the oceans and fish stocks are the shared responsibility of all. During the meetings, the Council mandate often changes on the spot, through negotiations with the member states. It is therefore very important to be in place and, although there is no direct economic interest from member states, there is a need for the ones who are dedicated to conservation and environmental considerations in fisheries to speak up and make their voices heard. D’ont like the Merkel and undemocratic unelected E.U. Tusk President too but where is such a whale mass killing statement of the Juncker-commission written into ? Who is really kiling whales actrually besides Japan and China ? I am co-author of this article. I subscribe the contents, with particular emphasis on the issues concerning FADs, but I sincerely apologise for the title of this paper.I do not think that the EU delegation at the ICCAT meeting can be classified as disgraceful. Far from it. While I may disagree personally with the options made, I fully respect the members of the delegation, their technical and negotiation skills and their commitment and openness to discuss their views, both at the official meeting as well as at the daily removal meetings with the Parliament delegation I was part of. I do not see myself reflected in the title of the article and I find that the title in no way reflects the situation. The title is not only unhappy but deeply unjust. I apologize, both the readers, but mainly the EU delegation at the ICCAT, for inadvertently neglecting this aspect.